Starting today (Sunday June 6th), we’ll be celebrating “Free-Launch-Week” with special added content. And starting tomorrow (Monday, June 7th) we’ll begin running the first of our in-depth “Sky Folk” series. This 7-part segment will focus on the life of WW2 Veteran, Glenn Mathews, who served in bombers during WW2, survived the war (and two spectacular crashes), then went on to become The Abbotsford Air Show’s announcer for more than 20 years (among many other adventures). We’ll have a new chapter of Glenn’s story – written in his own words – every day this week, along with Hi-Def videos of Glenn’s first flight since WW2 in a 1940 Fleet Finch trainer. 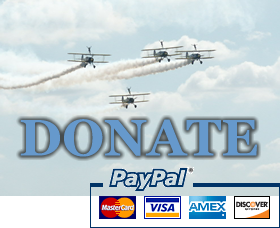 Our Contributors include many well-known Aviation Writers, such as Russell Munson & Richard Bach. But the other part of our mandate is to find, mentor & introduce “the next generation of Aviation Communicators” to the world. So look for new names along with the familiar. Right now, we invite you to come and take a look at the all new Why Fly for yourself. You can simply view the “Complimentary Content,” (by clicking on the “take a look” link to the right), or sign up as a member and gain access to everything on the site (by clicking on the “Free Membership” tab at the top). Remember … it doesn’t cost a cent, you’re under no obligation as a member, and we only ask for your E-address to protect Why Fly – and you – from spammers and hackers. For full information on the Why Fly transition, click on the “Editor’s Desk” tab above. We trust you’ll enjoy your visit, and sincerely hope you’ll decide to become a member of the Why Fly Family. We have lots of plans in store. Thanks & cheers till next time. P.S. As we have many new members signing up, we’ve decided to re-post Russ Munson’s kind letter of support, along with his phenomenal (acrophobia-inducing) image, and Richard Bach’s classic article, “Aviation or Flying, Take Your Pick” – the story that got me started in aviation way back in 1967! Sincere thanks again to both of these Aviation Legends.